It was the late 1980s. I found myself on the island of Maui, HI after a failed marriage, a ton of world travel, and a series of dead-end jobs. It is a beautiful place to live, warm and friendly, but life tends to leak out through the coconut shavings if you don’t pay attention. Serving grilled Mahi Mahi and Mai Tais to pink-skinned tourists was not exactly how I envisioned making my great mark on the planet. 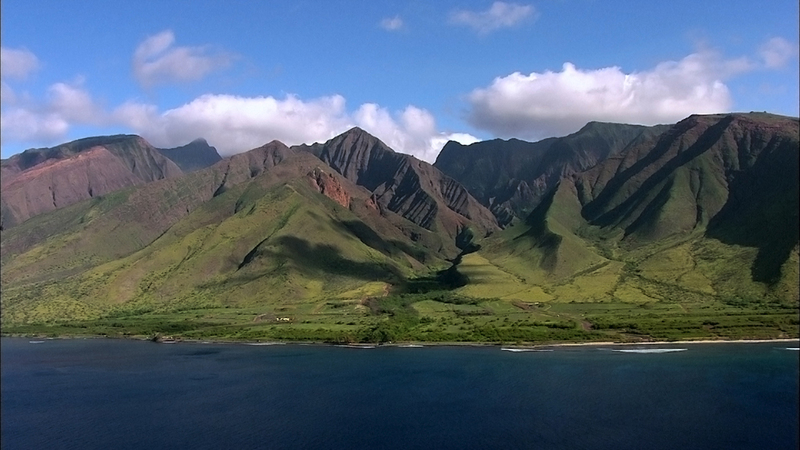 Millions of years ago, the island of Maui emerged from the ocean as two volcanoes, one now extinct and the other dormant, with a wide valley spreading between them. The two mountains couldn’t be more different; the smaller, older peak, Pu’u Kukui is choked with a blanket of thick, impenetrable foliage, where it rains virtually every day. 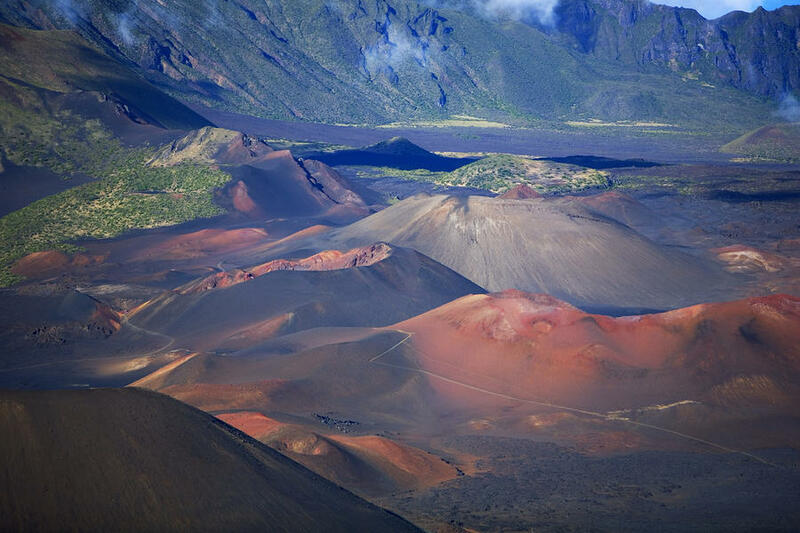 To the east, Haleakala towers over its older brother, nearly twice as high at 10,000 feet, a massive barren desert wasteland at its peak. I worked at the Maui Intercontinental Hotel as a waiter, bored and mildly depressed most of the time. One evening after watching a spectacular sunset over the ocean, I swore I’d do something spontaneous (and stupid), to shake up my life. I turned my back to the silver-blue of the ocean and looked up to the towering volcano of Haleakala looming high above. “Hell, I’ll hike through the crater tonight.” I told myself. I was an avid hiker, and had done the hike before – during the day of course, like all sane people. But it was a full moon that night, what could be better. I grabbed a single bottle of water, my beat-up tennis shoes, a windbreaker and threw them into my car and took off. Now this wasn’t just any car, but a Maui beater, as the locals called it. The previous owner had “sawed” the roof off of an old two door Ford Mustang to make it into a convertible. I thought it was the coolest thing ever when I bought it for $800. It rains a lot in Hawaii and metal rusts when it gets wet, salt air speeds up that process – a lot. The floorboards had mostly rotted out and you could see the road speeding by under your feet in places, so you had to be careful how you stepped into the car. You didn’t want to fall through the floor, or run with the car like the Flintstones. To stay dry in the car when it rained, I simply drove faster. It’s also warm in Hawaii, all year round, day and night. Like most of the people living there, I only wore my shoes to hike or work, otherwise it was flip flops, shorts and a tee shirt. A cold day was when you had to shut the windows, and that was only a few times a year. 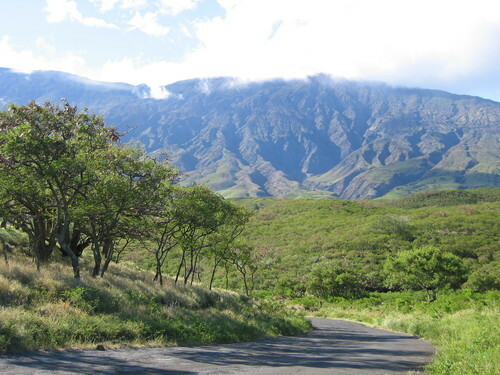 Haleakala is high enough to have a completely different climate, however. I hadn’t thought about that when I left the warm tropical night by the ocean. Halfway up the mountain I felt the temperature dropping, not too bad at first, just colder. I flipped on the heater in my car (which I’d never used before) and I was fine. About three quarters of the way up it started to rain lightly; I sped up a little so it went over the windshield. Another few miles up, the rain turned to sleet, then to hail, and finally to honest-to-god snow. Really, snow, in Hawaii. I thought seriously about turning back then; challenging oneself is a great thing and all, but not in shorts and a windbreaker. I was feeling sorry for myself though, and decided I needed a little more misery, so I plowed on. It was about 10 at night when I finally arrived at the top of Haleakala. A thick slushy layer of snow greeted me when I stepped out of my car in the empty parking lot. The wind was howling and cold, just above freezing. 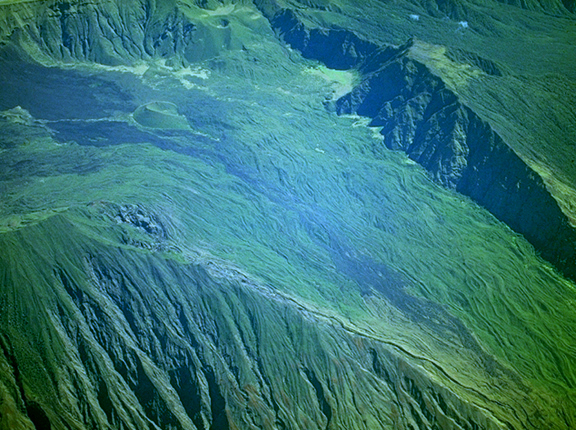 Haleakala is a huge mountain, nearly 100 miles in circumference at its base. The top is a blown out volcano crater, proud on one side and dropping away to the sea on the right. The rim rises again on the left to about 8,000 feet. The trail I was going take crosses the mouth of the crater, down the sloping rim dropping 3,500 feet to the valley floor, then follows that about eight or nine miles, then up, climbing steeply for about 2,000 feet and out of the crater. The total hike is about 12 miles. The tourist guides like to give you comparisons about the size of the crater, telling you it is large enough to swallow the entire island of Manhattan including the skyscrapers with room to spare. 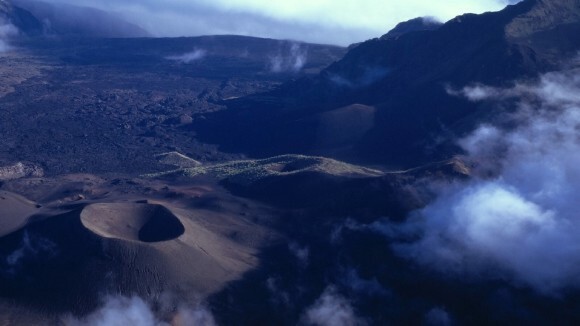 From the rim you can see what look like tiny volcanoes, cinder cones, dotting the crater floor. Those tiny volcanoes are actually quite large up close, some rising well over 200 feet high. And everything in there is colored charcoal or burnt-red like Beelzebub’s garden in Hell. I began walking now, following the well-worn trail, buoyed and energized by the gift of this single word and this amazing night. The volcanic soil crunched reassuringly under my feet with every step. Sometimes I would stand very still, holding my breath and listen. Nothing. It was so quiet my ears would ring, and my own heartbeat sounded like a drum in the unearthly silence. The descent to the crater floor took about two hours. 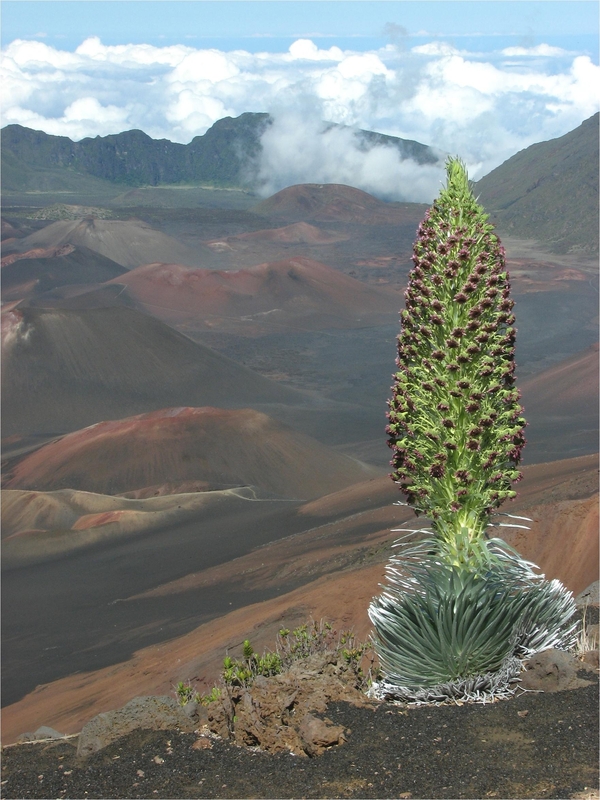 Little grows in this barren moonscape with the exception of a rare succulent called the silversword plant, which grows nowhere else in the world. My timing was excellent and I was able to see some of them flowering, blossoms glowing silver in the moonlight, jutting skyward on a single thick stock as wide and tall as a man. I passed dozens of these magnificent plants along the trail, each more beautiful than the last. A couple of miles along the crater floor, about 1 or 2 in the morning, heavy clouds moved in and it grew quite dark. At this point in the trail, there was a very important junction that I mustn’t miss. One way led up and out of the crater, my destination. The other led down and out the far side of the island through a dense rain forest ending at the ocean more than 20 miles away, to the rural, lightly inhabited far side of the island 60 miles away from where I lived. I didn’t have any food and just this one, nearly empty bottle of water. The wrong route would have made for two very long and miserable days. The ground was hard, dense volcanic rock, which didn’t show my tracks or the trail. I was lost. I spiraled out from where I stood trying to regain the trail. Nothing. The voice came to me again. “Rest,” it said. So I did. I lay on the hard ground and slept for about half an hour. I felt better when I got up and looked around for the trail again. There! Not the trail, but a single set of footprints, seemingly out of nowhere in a patch of soft volcanic dust. I followed them back to the main trail. Why hadn’t I seen them before? Never mind. Think what you like, but I choose to believe in angels that night. Everything was glorious after that. 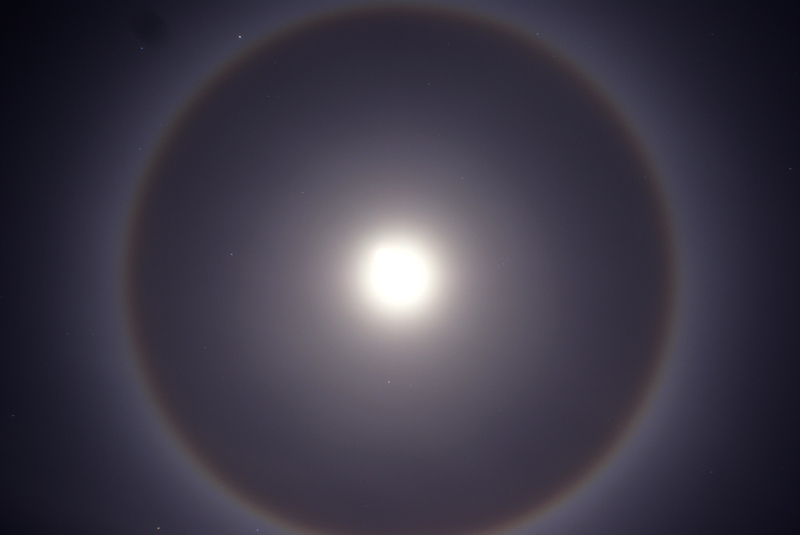 A light mist began falling which created a moon-bow high overhead. I had never seen or even heard of such a thing, a monochrome rainbow that circled the full moon, shining a dozen shades of silver. All of this beauty for one lone man in the middle of the night, in this gigantic, empty landscape, a dot of land in the vast Pacific Ocean. It was overwhelming. Hours later, I arrived at the final leg of the trail, a series of steep switchbacks up the far crater rim and out along a thin saddle-back. This is the most spectacular part of the hike, a naked ridge. One side drops down and away into the crater from where I came; the other side sweeps far down to the ocean 8,000 feet below. It is like straddling a knife’s edge in the sky. 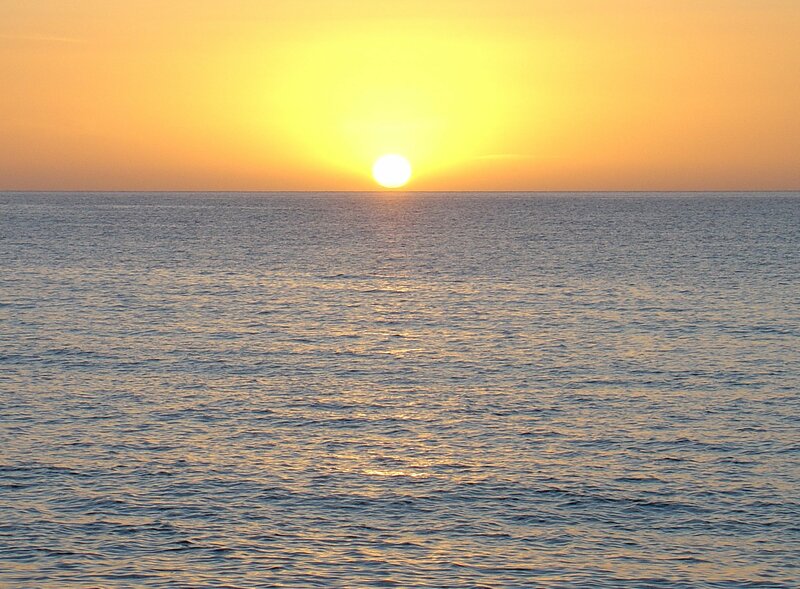 The moon was just setting into the ocean horizon to my left as the sun rose out of the sea to my right. It was and is the most magnificent thing I have ever seen. I lingered on that ridge for a time, exhausted and elated at the new day, and the end of my long and magical night. I said good-bye to Haleakala and my melancholy that day, realizing that life had been showering me with beauty and magic all along; I had only to open my eyes to it.